I am working on a couple projects this weekend - cards for Independence Day and Luminaries (bags) for next week's Cancer Walk. Since I am not ready to post those I will show you the card we made Thursday night. 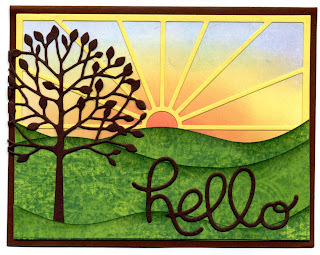 Jules got her new dies from Taylored Expressions and we decided to use the Ray of Sunshine die. 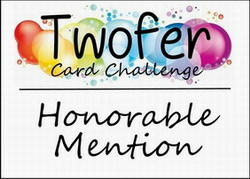 Our inspiration was on the Taylored Espression's blog found here. We sponged glossy paper for the background; glued on the yellow diecut rays rather than using them as a mask. We cut and sponged some green patterned paper for hills leaving them rolling in the horizon. 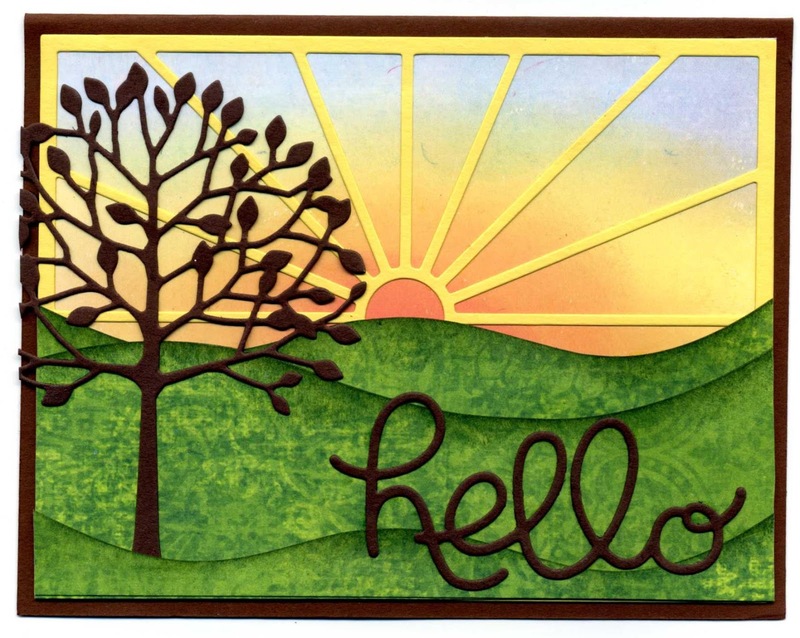 The tree and a Stampin' Up "hello" are diecut in dark brown because all we see is the shadow of them as we are looking into the sun. As the sun sets on another glorious day here, I will say good-night to my readers. Oh my, do I LOVE this card! The tree, the hills, the sun rays... Really gorgeous!